Sakata (酒田) is a great Edo style town located in the middle of Yamagata Prefecture. Sakata developed during Edo period by Shipping Industry. There are many great traditional houses still remaining in Sakata, especially Honma House is one of the largest Samurai House remaining in Yamagata. Also, the famous TV Show Oshin was shoot in this place. 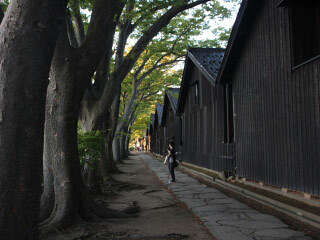 It offers great walking around the port town of Edo period. There is parking and restroom at Sankyosoko. 1. use local bus to Sankosoko. Sakata City is the 3rd largest city in Yamagata prefecture. It was used to be the capital of the land of Dewa. In 1672, the shipping route of west side was settled and Sakata became the largest port town in Yamagata. Then, many merchants visit Sakata and the culture of Kyoto, such as Geisya was imported from Kyoto. Today, those cultures are still exist and has a great view of traditional buildings. Abumiya was used to be the major warehouse of Sakata, Yamagata. In Edo period, Abumiya controlled the shipping industry. This house was used for the hotel for all traders and merchants. It is a great house that constructed in 1845. The house contains the 2 gardens, 13 rooms, store office and kitchen. Somaro is a classic restaurant located in Sakata, Yamagata Prefecture. It offers the Maiko (Geisya) Dance Performance that you can enjoy lunch with their dance performance. Maiko perform their dance at 2 p.m. as well. Somaro is reconstructed after 1894 earthquake. It was used to be the hotel and restaurants. This house also displays many collections of art works such as panting. Sankyo Soko is the symbol of Sakata, Yamagata Prefecture. It is the group of classic storages constructed in 1893. There are Keyaki Trees for keeping temperatures and moisture low. There are 12 buildings remaining here and some of them are still in use. They are used for the storage for rice. The moisture and temperature are perceived in low for the rice. It was used for famous TV show, Oshin. It is one of the largest Samurai House in Yamagata prefecture. This house was constructed in 1768 by 3rd lord of Honma family. It takes unique feature of architecture.